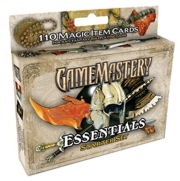 GameMastery Item Cards: Essentials is a 110-card set formed from the out-of-print GameMastery Item Pack One and the follow-up Hero�s Hoard and Relics of War booster sets combined together for the first time ever. Essentials is the "starter deck" for the Item Cards line, and it contains everything you need to begin incorporating these easy-to-use cards into your fantasy roleplaying campaign. Inside each box, you�ll find treasure, armor, weapons, wands, and more! Each card features a beautiful full-color illustration of an item on one side, with a text description and room for hand-written notes on the opposite side. Game Masters can hand these out when their PCs get treasure and watch as players learn to love managing their booty. Useable by experienced GMs and novices alike, this product fits perfectly into any Game Master�s arsenal! NOTE: GameMastery Item Cards: Essentials does not contain every card from Item Pack One, Hero�s Hoard, and Relics of War.